K Das, A El-Menyar, J Suwaidi. Multidetector Computed Tomography Diagnosis of Subclavian Artery Dissection Following Endovascular Treatment. The Internet Journal of Cardiology. 2006 Volume 5 Number 1. We report a case of a 63-year-old man where multi-detector cardiac computed tomography (MDCT) revealed dissection of left subclavian artery following percutaneous transluminal angioplasty (PTA) to left anterior descending artery. Percutaneous access through subclavian artery has been well described for the treatment of subclavian artery or LIMA stenosis. The complications although rare, include dissection, distal embolisation and hematoma 1. 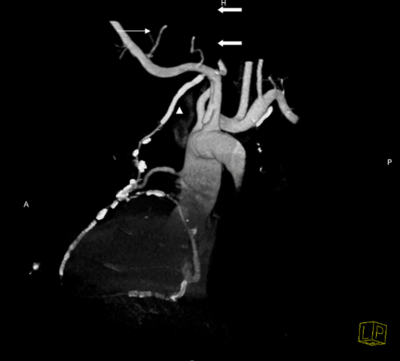 We report a case of subclavian artery dissection diagnosed by MDCT, developed following endovascular treatment of the left anterior descending artery stenosis. A 63 year old male was referred for the evaluation of the coronary stent restenosis. He had multivessel disease and had LIMA graft to LAD, venous graft to RCA, OM1 and OM2. On the follow up with SPECT a large reversible inferolateral ischemia was revealed. Subsequently, multiple graft stenoses was diagnosed and treated with multiple stent insertion. Seven stents were put in RCA and another two stents were put in the LAD through LIMA. During the LAD stent deployment he developed LIMA dissection and it was treated with two stents. All these procedures were done after the bypass surgery elsewhere outside our hospital. MDCT (Somatom Sensation 64, Siemens Medical Solutions, and Erlangen, Germany) revealed the RCA graft and all those seven stents were patent. The venous graft to the OM 1 was blocked totally. The OM2 venous graft had a tight stenosis at the origin (Fig 1). The LIMA stents were patent and there was dissection of the subclavian artery proximal to the origin of the LIMA (Fig 1& 2). As the patient did not have any symptom related to the dissection no further intervention was carried out and the he was put on conservative treatment. Figure 1: Volume rendering 3D CT image showing the LIMA with stent (arrow) anastomosed to left anterior descending graft with multiple stents. Linear dissection (thick arrow) of the subclavian artery is seen proximal to the origin of the LIMA. The origin of the venous graft to OM2 shows a high grade stenosis (arrowhead). 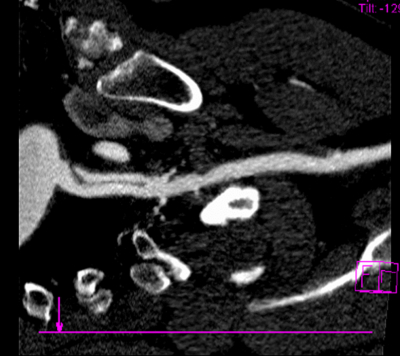 Figure 2: Multiplanar reformat CT image showing the dissection of the subclavian artery (thick arrow). The dissection of the subclavian artery is usually caused by trauma 2, sports injury 3, iatrogenic injury 4,5 and Marfan syndrome 6. Our patient developed subclavian artery dissection following catheterization. The LIMA dissection was treated by the stent and the subclavian dissection was managed conservatively. Iatrogenic dissection is a well known complication and has been reported to threaten the patency of the peripheral vessels in 1-7% of the PTA procedure 7. Percutaneous balloon dilation, stenting and atherectomy have been recommended as a treatment of such complications 7, 8. Subclavian artery dissection may be difficult to diagnose by angiography because of thrombosed pseudolumen and MDCT has recently been used for the diagnosis of such cases 7. The unique advantage of MDCT is that it is non invasive and can clearly demonstrate the intra as well as extra luminal details of the anomaly in a 3D manner. The coronary stent lumen is very well visualized in the 64-Slice MDCT and in one of our present study revealed sensitivity, specificity, positive predictive value, negative predictive value and accuracy of computed tomography coronary angiography in the detection of in-stent restenosis was 96.9%, 88.0 %, 77.5%, 98.5% and 91% respectively 8. In the present case we could visualize all coronary as well as the graft stents and they were all patent. In conclusion, iatrogenic dissection of the subclavian artery is a rare complication and MDCT may play a complimentary role to highlight the intricate details of such complications in a global manner. 1. Bogey WM, Demasi RJ, Tripp MD, Vithalani R et al, Percutaneous transluminal angioplasty for subclavian artery stensosis. Am Surg 1994; 60:103-106. 2. Myers SI, Harward TR, Cagle L: Isolated subclavian artery dissection after blunt trauma. Surgery 1991; 109: 336-338. 3. Scheffler P, Uder M, Gross J, Pindur G: Dissection of the proximal subclavian artery with consecutive thrombosis and embolic occlusion of the hand arteries after playing golf. Am J Sports Med 2003; 31: 137-140. 4. Schmitter SP, Marx M, Bernstein R, Wack J, Semba CP, Dake MD: Angioplasty-induced subclavian artery dissection in a patient with internal mammary artery graft: treatment with endovascular stent and stent-graft. AJR Am J Roentgenol 1995; 165: 449-451. 5. Frohwein S, Ververis JJ, Marshall JJ: Subclavian artery dissection during diagnostic cardiac catheterization: The role of conservative management. Cathet Cardiovasc Diagn 1995; 34: 313-317. 6.	de Virgilio C, Cherry KJ Jr, Schaff HV. Multiple aneurysms and aortic dissection: an unusual manifestation of Marfan's syndrome. Ann Vasc Surg. 1994; 8:383-386. 7. Becker GJ, Palmaz JC, Rees CR et al, Angioplasty-induces dissections in human iliac arteries: management with Palmaz balloon-expandable intraluminal stentss. Radiology 1990; 176:31-38. 8. Murphy TP, Dorfman GS, Segall M, Carney WI. Iatrogenic arterial dissection: treatment by percutaneous transluminal angioplasty. Cardiovasc Intervent Radiol 1991; 14:302-306. 9. Iwamuro Y, Nakahara I, Tanaka M, Higashi T, Watanabe Y, Harada K, Fujimoto M, Oku T. Occlusion of the vertebral artery secondary to dissection of the subclavian artery--case report. Neurol Med Chir (Tokyo) 2005; 45:97-99. 10. Das KM, El-Menyar AA, Ammar Salam, Wafer Dabdoob, Hajar Al Binali, Suwaidi JA. Contrast enhanced 64-slice multi-detector computed tomography coronary angiography versus conventional invasive quantitative coronary angiography in coronary artery stent assessment. Radiology 2007 in prints.